These products provide a cleaning product ready to use in a few hours once it is released into a container of water. 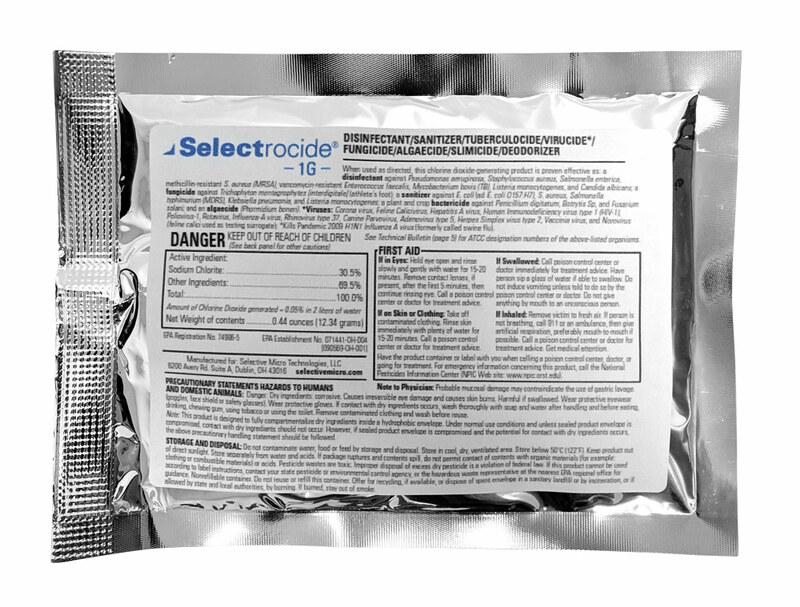 The Selectrocide® 12G generates 6 gallons of 500 ppm ultra-pure ClO₂ and is intended for applications that require large amounts of pure ClO₂. The 12G is easy to use. Simply remove the sachet and place it in a covered tank or bucket and generate for 2 hours. Dilute the solution to ﬁt your needs. The 12G is registered with the Environmental Protection Agency as a pesticide and falls within the lowest toxicity categories. The 12G is also recognized and registered with the Organic Materials Review institute. The 12G is commonly used for agricultural applications, hard, non-porous surfaces, food contact surfaces and general disinfection. 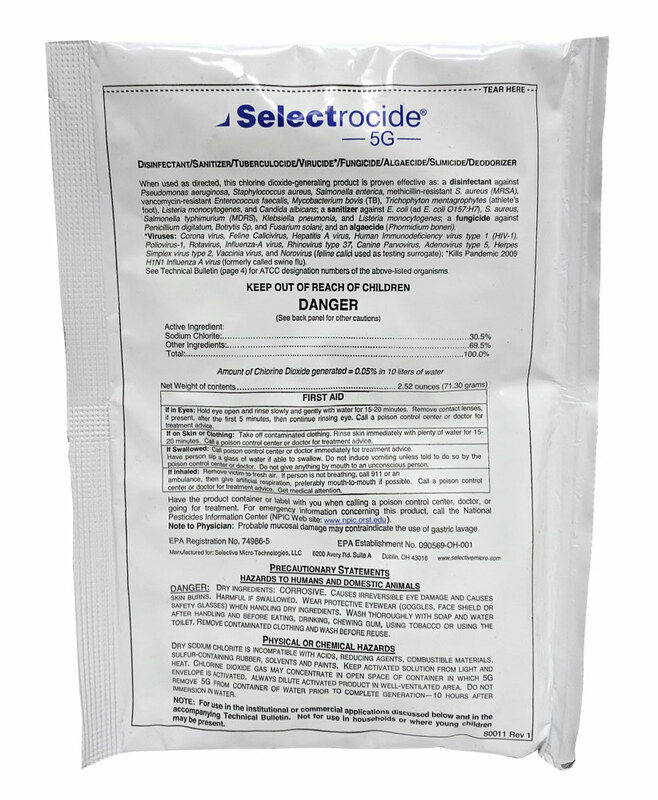 The Selectrocide® 5G generates 2.5 gallons of 500 ppm ultra-pure ClO₂ and is intended for applications that require moderate to large amounts of pure ClO₂. The 5G is easy to use. Simply remove the sachet and place it in a covered receptacle and generate for 6 hours. Dilute the solution to fit your needs. The 5G is registered with the Environmental Protection Agency as a pesticide and falls within the lowest toxicity categories. The 5G is commonly used for agricultural applications, hard, non-porous surfaces, food contact surfaces and general sanitization. The Selectrocide 1G generates 2 liters of 500 ppm ultra-pure ClO₂ and is intended for applications that require small amounts of pure ClO₂ in a convenient format. The 1G product is similar to the 2L500, but without the pouch. Therefore this small sachet can be generated directly in sprayers or other application devices for ease of use. The 1G is registered with the Environmental Protection Agency as a pesticide and falls within the lowest toxicity categories. The 2L500 is also recognized and registered with the Organic Materials Review Institute. The product is commonly used for hard, non-porous surfaces, food contact surfaces, and general sanitization. The Selectrocide® 2L500 generates 2 liters of 500 ppm ultra-pure ClO₂ and is intended for applications that require small amounts of pure ClO₂ in a convenient format. Since the 2L500 comes in a ready-to-use pouch it is easy to use. Simply fill the pouch, and allow the solution to generate for 2 hours. Dilute the solution to fit your needs. The 2L500 is registered with the Environmental Protection Agency as a pesticide and falls within the lowest toxicity categories. The 2L500 is also recognized and registered with the Organic Materials Review institute. This product is commonly used for agricultural applications, hard, non-porous surfaces, food contact surfaces and general sanitization. The CLO2BBER generates 1 liter of 100 ppm ultra-pure ClO₂ in 30 minutes. 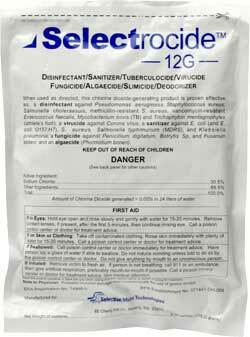 It is intended for applications that require small amounts of pure ClO₂ in a convenient format. 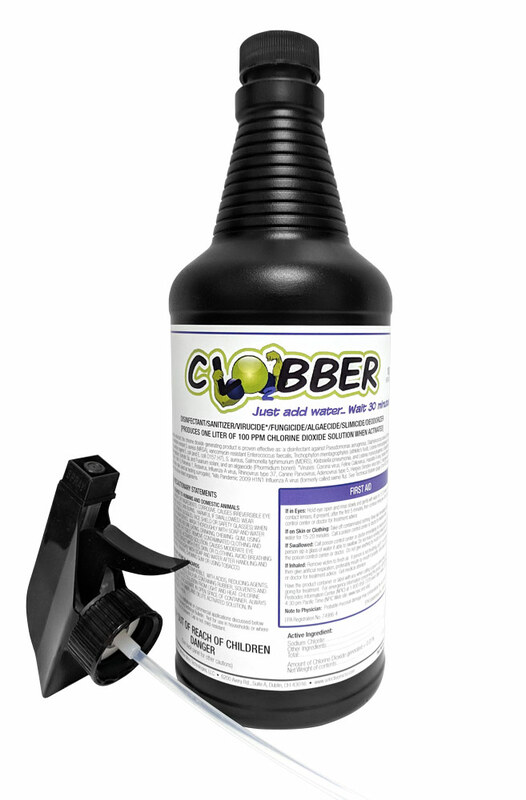 CLO2BBER comes in a 32 ounce bottle with a spray nozzle included. Simply fill the bottle and allow the solution to generate for 30 minutes. This product is a ready-to-use disinfectant . 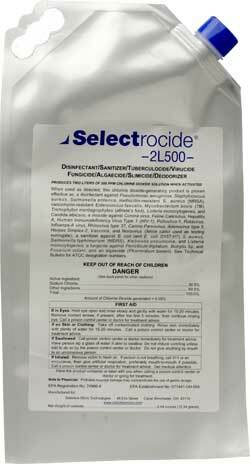 CLO2BBER is registered with the Environmental Protection Agency as a pesticide and falls within the lowest toxicity categories. This product is commonly used for small scale hard surface disinfection and deodorization.